The Vancouver based jewelry line, coastal chains was one of the many incredible vendors at lululemon's SeaWheeze Sunset Festival this year. Inspired by mountains, nature, and a love for the west coast, coastal chains is made for people who appreciate natural beauty, adventure, and being outdoors. “My line represents everything I love,” Keri says to me, smiling. She’s holding a mug of tea between her hands and has a collection of silver rings on each of her fingers. One of them is the mountain ring, designed in the shape of a mountaintop. Spotted across all collections, mountains are a signature theme and component of coastal chains. The way Keri makes her jewelry is a very intricate process. For all her rings, she starts out using sheet metal and pencils in the design of what she wants the shape to be. She then uses a tiny saw to cut out the shape, and a soldering gun to soften the metal. Then, she uses a file to carefully shape the ring. The entire process takes approximately an hour to two hours, per piece. But time isn’t a concern for Keri. “I truly love what I’m doing, so time goes by really fast. When I’m designing jewelry, I have the tendency to get lost in the entire experience in the best way possible. I also really enjoy spending time in my studio—it’s my sanctuary,” she says. Now that Keri has finally found her groove, she says that everything else is icing on the cake. “I feel so fortunate doing something I love.” She’s currently in the work of creating some new pieces, inspired by the popular Vancouver cycling studio Ride Cycle. “Stay tuned,” she says. In the spirit of SeaWheeze, what’s your SeaWheeze 2017 highlight? In August I ran into a good friend of mine - Molly Wengler. Molly is the ivivva Showroom Manager in Minnesota and lives a life "all about joy, connection + love". When I ran into Molly she was excited to share that she has been working with Imagine 1 Day, and in 2017 she will be going to Ethiopia to help spread the practice of igolu to the world. She is currently raising $10,000 and as part of her Fundraiser she approached me with a collaboration idea. Together we would sell a customized piece of jewelry with 50% of the proceeds going towards her fundraising campaign. Obviously I said yes. To learn more about Molly and the reasons why she choose what she is doing I sat down to ask her a couple questions, this is what I found out..
Q. Keri - You obviously have a passion for giving back, what made you choose Imagine 1 day? A. Molly - There are many things about imagine1day that made it an authentic choice for me. I appreciate the model that is used to support education in Ethiopia, there is a commitment from the communities themselves, which creates a beautiful partnership with sustainable changes. I am also a "YES!" for their commitment to supporting leadership programming in their schools, specifically the work of igolu, which is a body of work that has had a huge impact in my life. The combination of leadership, communication, and education is something that lights me up. This work is the perfect way to contribute to something I believe in. Q. Keri - What impact do you hope to have by going to Ethiopia? A. Molly - I believe this trip will begin the conversation of a global change in how we educate our children. Bringing leadership and communication into the classroom is what I believe to be the future of education across the globe. Q. Keri - What made you want to collaborate with coastal chains? A. Molly - When I spent a year in Vancouver, Keri was one of the first people I connected with. The fact that she creates beautiful things was a bonus addition to knowing her as a person. I love supporting entrepreneurs and totally adore the things she creates! Q. Keri - What does the possibility necklace mean to you? A. Molly - There are several igolu principles represented in this necklace. The first is the circle, it represents the power of knowing what you want; living with intention of what you want in your circle. The name “possibility” represents creating a future from above the line; living in choice, creativity, and possibility. These principles, along with the other igolu work, have a strong presence in my life and are what I get to share with the world on this trip. To support, purchase a possibility necklace or donate directly to Molly's Fundraiser here. When I think about myself and my core values, ADVENTURE is always at the top of my list (along with love, fun, family and trust). And when I reflect on the past six months travelling through Central and South America that is exactly what this trip has been, one epic adventure! I trekked through the Andes, visited a world wonder, surfed the Pacific coast and submitted a volcano. I went sand boarding in the Peruvian desert, snorkelled in crystal clear cenotes and kayaked for hours. I’ve seen 360˚ views on mountain tops, swam in infinity pools and looked up at 30 story waterfalls. I went whitewater rafting, zip-lining, paragliding, biking and horseback riding. I carried a candle through a cave, jumped off cliffs and tubbed down a river. I learned Spanish, went to a local soccer game, salsa danced and helped make tortillas from scratch. I met jewellers, explored new jewellery techniques and have a notebook full of new designs. I expanded my understanding of the world, I learned about new cultures and got to know myself on a deeper level. I had good days and bad; I dreamed of travelling forever and I craved the comfort of home. I met some of the most beautiful and interesting people. Fellow travellers from all over the world, each one with a different story to tell about why they are travelling, where they have been and where they dream of going. Locals who I owe all of my thanks to, the number of kind and caring people who welcomed us in, helped us with directions, warned us to keep safe, fed us, housed us, helped improve our Spanish and showed us the magic of their country, I am forever in your debt. The children won over my heart with their curious eyes watching you carefully from behind their mothers backs. The street dogs made me want a dog of my own even more than when I left (if that is possible). I feel so much gratitude towards the people I’ve met, to Pacha Mama (mother earth), to my best friend, travelling partner and lover Peter, to my parents and most importantly to myself for seeking out the adventure and taking the risk. This one I will never forget. Peru is known for it’s high altitude mountains and trekking; the most popular and highly advertised is of course Machu Picchu. While in Peru, Peter and I wanted to take advantage of this beautiful terrain and find some treks a little less travelled. We learned about Colca Canyon from fellow travellers and online research. Anyone who had done the trek raved about it and claimed it to be a “must see” activity for the outdoor enthusiast. On day one of our three day trek we left Cabanaconde (3,287m) early in the morning. It was a simple 10 minute walk out of town and then all of a sudden you are smack in the canyon, 360 degrees surrounded by mountains. The lower mountains made up the canyon and towering above are the Andes. I have never in my life seen mountains so grand. The hike took approximately four hours with few to no breaks. The entire time we didn’t see another human being. It was incredible to be passing through the canyon alone, no other sounds but of the rocks knocking together under our feet. We chose to spend our first night in Llahuar (2,020m) because of it’s natural hot springs. We sat beside the river, mountains high above us, going back and forth between the hot springs and the freezing cold river water. What a way to relax after a day of hiking. Day two of three was similar, we rose early and started our trek. We climbed 800 meters up the other side of the canyon only to descend 700 meters back down to Sangalle (2,160m), a small village built inside a natural oasis where we spent our second night. One of the reasons I love hiking so much (apart from the beauty) is for the time spent to think. Whenever I’m in the mountains or in nature I find my mind clear and I’m able to think clear thoughts. On this particular day I spent my time thinking about my business. How do I want to grow coastal chains, what are my next steps, what can I do now to get me to my future goals? I came up with a couple new ideas and I know that when I am back home putting them into practice that I am going to be reminded of the Colca Canyon trek. Then comes day three. The shortest but the most challenging of them all. We hiked 1130 meters directly uphill for three hours to reach town. What a great feeling it was when we reached the top. We immediately went for tea, coffee and breakfast to celebrate our adventure. We sealed the memories with a single “salud” (“cheers”) and continued to our next destination. If you’ve ever taken a trip I’m sure you’ve been asked, “where was your favourite place?”, or “what was the highlight of your trip?”. Of course I love this question, it’s an open invitation to talk about all the beautiful places I’ve been and all the incredible places I’ve experienced; but it can often be a hard question to answer. Each country, each town, each place is so unique in it’s own special way. It is hard to compare a big bustling city to a quiet countryside, a coastal town to one high in the mountains, or a vast sandy desert to a rolling green valley. Although the question is a hard one I can say with assertion that the San Blas islands be in the top 3. To pay tribute to this beauty I set out on a mission to find materials that I could use to make jewellery that reminded me of the San Blas islands. All through Colombia I scoured every town for materials: beads, stones, whatever inspired me really. To my surprise I was quite successful! I bought three beautiful raw Emeralds from Boyoca (a region of Colombia that holds the biggest Emerald mines in the world) evil eye beads and charms in Medellin (previously characterized as the most dangerous city in the world, today an incredible city filled with innovation and beauty), and a variety of beads the colours of the ocean in Cartagena (a beautiful old city in Northern Colombia). With these new found ingredients I played around and have created the evil eye collection, the coastal necklace collection and soon to come, the coastal bracelet collection (all can be purchased under the shop section of this site, select ‘travel jewellery’, click the price and insert the description of your desired piece). Everyday on the road is a new day to be inspired, inspiration breeds my creativity and my creativity leads to new jewellery. The circle of a jewellers life. “Bienvenidos!”, “Welcome to my country!”. Colombia: a country only two decades ago was called one of the most dangerous countries in the world. A country whose history is filled of violence, drugs and displacement. A country that has been deprived of tourism for so long that every single person welcomes you to their country. A country recently rated the happiest on the world. A country where if you stand with an open map people will ask you if you need help. Colombia: hands down one of my favourite countries of the trip. After travelling through Colombia for exactly one month I can’t stop asking myself one question: how can a community of people who have witnessed so much violence and corruption, who have a high likelihood of having lost a friend or family member to the war on drugs also be some of the happiest people in the world? During a walking tour in Medellin an old man slowly approached our group, a cane in one hand and a strong coffee in the other, he welcomed us to his country, he thanked us for coming and wished us safe travels. A women in a restaurant welcomed us to town, she was kind and bubbly and showed her affection well, after only talking for 5 minutes she complimented us and told us how lucky we were to have each other. While standing at a bus stop with our bags in a heap a man approached and asked if we were going to the airport, he showed us a place where we could catch a better bus, faster, cleaner and more likely to have seats for us, and then walked off asking for nothing in return. I have loads more of these stories, countless interactions with people that left me smiling. The Colombian people are a reminder that even when things get tough it is still possible to hold your head high, a suppressed past doesn’t mean there is no hope for the future, and that no matter the day try and find something in it to make you happy. The woman painted in this particular display of street art is an excellent example, is she crying from sadness or happiness? I, and many others believe she is crying out of pure happiness. Imagine life was in black and white, the only variety shades of grey. How different would life be like? After 3 months of travelling through Central America I have grown to be so appreciative of all the colours. Fresh fruit and vegetables, the Pacific setting sun, traditional dress etc., but some of the most beautiful colours I have seen in my life were in the San Blas Islands. The San Blas Islands are a group of 365 islands located between Panama and Colombia. However these aren’t just any islands, these islands are picture perfect.. paradise.. heaven. Each island a slope of crystal white sand, extending beyond the sand the turquoise water gradually grows into a deep blue; beneath the water a colourful life of coral reefs. The palm trees stand tall and cast a gorgeous contrast of sea foam and hunter greens mixed with pops of yellow. Every island beautiful in it’s own unique way: a couple were home to one single palm, some would host an entire palm forest while others inhabited the indigenous Kuna people. Peter and I travelled through the San Blas Islands on a speedboat with a group of 19 other travellers. We were told that the seas would get rough and that we would definitely get soaked. Although we were forewarned I don’t think any of us expected what was ahead. This tiny boat, with a confident captain, would sail through the waves at top speed. We’d smash the waves, airborne out of our seats, the entire boat laughing and screaming, the captain giggling to himself. It made for a very fun few hours and our group immediately became a close family. Once we reached our paradise islands we’d have the day together to play and explore. We'd snorkel in the reefs, sun bathe, play sports and sip on fresh coconuts and cold beers. Just before the sun would start to set we’d jump into the boat again to take us to our accommodation for the night, this normally consisted of a group of hammocks hanging under a thatched roof, sand underfoot. Here we got to learn a great deal about the Kuna culture from our guides, we explored the villages and played with the children. By nightfall, naturally the drinks would start to flow and the rest of the evenings were filled with laughter, dancing, bonfires and soccer playoffs. Bonded with our new friends and not wanting to separate, we all travelled together in Colombia for the next week. We explored Cartagena and then met up in Barranquilla for Carnaval (the second largest Carnaval in the world, after Rio). To everyone I met - you are rad, I love you and if you are ever in Vancouver you know who to call! A soft coat, a gentle demeanour and a smell that I cannot describe. Horses, one of my favourite animals on earth. My entire existence as a child and teenager revolved around horses. I took care of them, rode competitively and spent every evening, weekend and summer surrounded by them. My childhood is a happy one. So you can imagine my excitement to have the opportunity to ride one of these incredible creatures again after so long. The “naughty”, “frisky” or “bad” horses were always my favourite growing up, and it turns out they still are. When we met our guide I told him in Spanish that I rode horses as a young girl, he changed his mind and decided to let me ride the horse that only “experienced riders” could handle. This made me very happy. We spent three incredible hours travelling by horseback. Arenal Volcano was our backdrop, we rode next to the Lake and were always surrounded by rolling hills, it was absolutely breathtaking! Costa Rica is known for its beauty and I see where all the hype comes from. Then out of the blue our guide would say “gallop” and we’d take off! I cannot describe in words how happy this made me. I feel as if a butterfly is trapped in my heart, every time I think back on our ride the happiness flutters throughout my body. It’s important to remember what makes you happy and to bring these components into your life as much as possible. As we bump along the dirt road I find myself starring out the window. Watching the small towns zip by, locals hard at work, farmlands in the distance. Travelling by local bus is not only cheap but it gives me the opportunity to get lost in my thoughts. We’ve been travelling almost 3 months now which means according to our plans we have 3 months left. The truth is I love it - I love exploring a new country, a new town, I love tasting the different foods, learning about the different cultures. But the real truth is that I miss home more than I had expected. I miss my friends, I miss having a routine, having a purpose and sometimes most of all, I miss making jewellery. All the daydreaming makes me eager to get back to my bench, to experiment my new ideas, to hold, cut and solder silver again. I dream about the possibility of taking costal chains full time when I arrive home. I have ideas. I have dreams. I am eager. But as much as I miss it, I know the most important thing for me right now is to keep travelling, keep exploring and to keep generating ideas. And when I get home I’m taking things to a whole new level! Surfing is not like riding a bike. I quickly realized this after surfing in Australia for a year (2005), to then only surfing once or twice a year. The sport is extremely technical, and when done well looks way too easy. I think anyone who has surfed before would agree that it is a difficult sport but also one that brings so much excitement and satisfaction when done well. For me, catching a good wave is like riding a fresh line through the trees on my snowboard; for others it could be scoring a goal, hitting a touchdown, sinking a hole in one. Another great thing about being in the water is watching those around you surf, and I have never seen so much surf style as I have in El Tunco, El Salvador. The El Salvadorian surfers, tanned from a lifetime under the hot sun, arrive by foot or bike with their short board under one arm. They hit the water and it only takes them seconds until they are in the ripple of waves, shouting in Spanish at their friends. A simple two strokes and they’ve caught a wave, one second and they are up and quickly descending the wave as it crashes around them. But their style.. that is the most incredible thing to watch. They maneuver quickly, slashing up and down the waves, dodging other surfers in the water. Many have playful tricks up their sleeves: 180’s, riding backwards, toe grabs, some would turn harshly back into the surf and get kicked up high in the air then dive back into the water. It was absolutely incredible to watch. My favourite time to surf in El Tunco was during sunset. Watching the reflection glitter off the water, catching a wave and riding beside the setting sun. Many traveller’s choose to avoid El Salvador because of the danger they hear in the news. I encourage anyone who is or will be travelling Central America in the future to consider El Tunco in their travel plans, truly it is a little surfing paradise. El Paredon is a small town on Guatemala’s Pacific coast. Generally traveller’s follow a similar path through a country, “the gringo trail”. It makes plenty of sense, especially for traveller’s like Peter and myself who generally only think about the next one or two destinations, deciding where to go based on our conversations with fellow travellers. El Paredon however was an exception to this rule. Peter’s good friend Matt recommended the little surf town and besides that we hadn’t run into many people who had been, let alone who had heard of the town. This definitely made it more difficult to find information on how to get to their however we were determined to find the cheapest route. In the end we took three "chicken buses" (old Canadian/American yellow school buses converted into colourful modes of transportation, blasting music and stopping for anyone or anything that needs a ride), followed by a tuk tuk (a small vehicle with three wheels that zip around small towns), then onto a boat (crafted out of whatever wood and material they could find to keep it afloat), and finished with a long walk through the sweltering heat until we finally found our hostel. I’ve never been so happy to see a pool in my life! Not only is El Pardon a beautiful beach but the surf is great for beginners. The beach is long which leaves plenty of room for surfers to spread out. The town is small and off the beaten path which creates less people in general and the waves build up to the perfect size to catch before they break and run to shore. Peter and I spent three full days surfing. We woke up to watch the sun rise, surfed into the afternoons and normally finished with a sunset session. Between surfing we’d wander through the small town, equipped with two restaurants, a handful of “Tienda’s” to buy a couple snacks and an NGO that helps create jobs for women and children. It felt great to get off the gringo trail for a few days and into the surf. If you find yourself travelling through Guatemala and too need to get away for a bit I highly recommend this small town. It occurred to me the other day that my travels have created a pattern: In 2005 I lived in Australia for a year and travelled through New Zealand and Southeast Asia. In 2010 I lived in Zanzibar for 3 months then backpacked throughout Europe for another 3 months. And here Peter and I are in 2015 travelling through Central and South America. Apparently every 5 years I get the itch to travel. Where will I end up in 2020 I wondered? Backpacking through Africa? Maybe Eastern Europe? Or perhaps I’ll choose to stay close to home, buy a van and drive across Canada and the US? From a young age I grew up hearing travel stories from both my parents and my grandparents. My parents - the generation of lucky people who got to live through the hippy era travelled together in their mid-20’s. After having my two brothers and myself they didn’t stop, even as young kids I remember trips down to Mexico, Venezuela and through the US. My grandfather himself was a travel writer. He wrote a column in the Toronto Sun telling his stories of travelling around the world. I remember Sunday dinners at my grandparents sitting around a slide projector listening to story after story as they flicked through their black and white photos. I am so grateful for my upbringing, without it I’m not sure if I would have seen or experienced what I have. In the same breath I believe anyone has the ability to travel if they truly want to. I’ve often been told how lucky I am that I get to travel but the truth is it’s not luck. I’ve travelled because I made the choice to do so, and the choice is always a risk. Leaving a great job, a beautiful home with close friends and family to travel and not know what I will return to is a huge risk. It is a risk, but in my mind a risk worth taking. So take a minute, look inside yourself and your life. What do you keep saying you want to see or do but are making excuses for? What are the risks that you aren't taking that could change your life? When my grandfather passed we had a table of his passports at the funeral. Each one was filled with stamps, memories of all the places he has been. My goal is to fill my passports as well, each stamp like a tattoo: permanent, each one with a story to tell. One of my favourite things about travelling is experiencing the different cultures around the world. Upon entering Guatemala it was immediately clear that this was a country rich in culture. 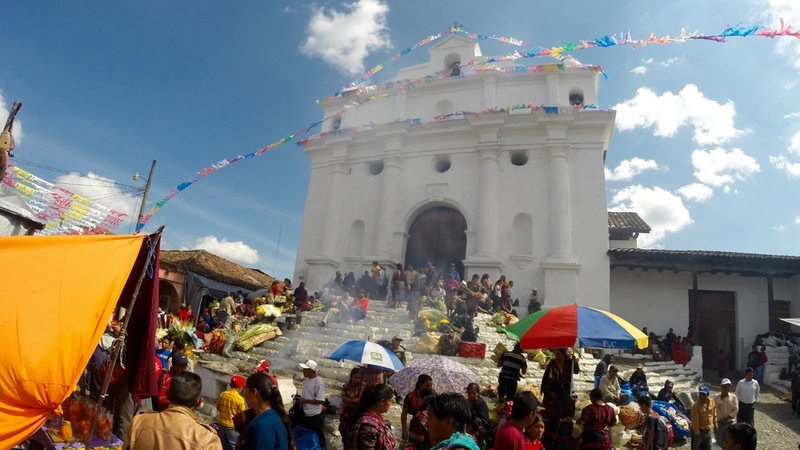 From Tikal to Lanquin, Antigua to Lake Atitlan, and Chichicastenango to el Paredon every town although different from the last was similar in terms of their commitment to cultural values and strong appreciation for their Mayan history. Exploring local markets has been the best way we have been able to experience a new town's culture. Every place we visit, no matter how big or small, has a local market, and the largest market in all of Central America is in Chichicastenango, Guatemala. Every Thursday and Sunday people flock from all over the country to sell fresh fruit, vegetables, and handmade goods. The men and women are dressed in intricate hand-embroidered clothing, all with the distinct colours and designs unique to their region/town - it’s truly an experience to see. After four hours of exploring we left with a few Christmas gifts, full stomaches, great conversations and best of all seven beautiful pieces of Jade. The powerful green colour will forever remind me of the natural beauty of this country. Five years ago I spent three months teaching English in Zanzibar, Tanzania, Africa. One of my favourite things about this experience was that I was living completely amongst the people, I learned so much about their religion, the food they ate, what they did for fun, their beliefs etc. Peter and I knew we wanted to take Spanish classes in Guatemala and we decided on San Pedro, a little town on Lake Atitlan, Guatemala. We took 4 hours of Spanish classes a day for 5 days and lived with a local family. Maria y Ventura nuestros padres (our parents) and Manuella y Juan nuestros hermanos (our siblings) took us in with a warm welcome. They taught us everything about traditional food from how to make tortillas from scratch (a lengthly process that Guatemalan women perform everyday) to how make traditional salsas, ceviches, tamales etc. We got to experience a traditional ceremony that was performed for the daughter and learned about what a day in the life looks like for a local Guatemalan. After feeling so welcomed I wanted to make something special to give back. I decided that a colourful necklace for my second mother and sister would be the perfect gift! They too had a bucket of beads that they've been collecting over time so I made the necklace with a combination of beads. The women in Guatemala dress in a traditional hand-embroidered blouse and skirt and I just loved how the colourful necklaces matched their colourful dress. Muchas gracias mi nueva familia! Dreaming, drawing and reflecting are some of the most important aspects when designing new products. Bacalar is this little village not far off the overly touristic towns of Cancun, Playa del Carmen and Tulum. Bacalar is located on a lagoon. The lagoon is often referred to as the 'lagoon of seven colours' because the it hosts seven shades of blue/aqua water. It is breathtaking. And what better place to dream, draw and reflect? With only one full day in Bacalar (before taking a bus through Belize into Guatemala) I spent the afternoon on a hammock resting over the blue lagoon drawing future designs. I quickly realized how few designs I currently have posted on my website and want to double or quadruple this number to provide more options to my guests. After drawing for an hour or two I quickly had a few pages of designs. I was pumped. I could have kept drawing for hours expect I heard the 'coco frio man' arrive (a man that drives around a scooter with a cooler on the back delivering cold coconuts). In Puerto Escondido we discovered coco frios, cold coconuts that you drink the water from (very hydrating in a hot country) then eat the meat. However it gets better, you had lime juice and chili powder to the meat and it takes it to a whole new level. Needless to say the coco frio broke my attention but I was so grateful for the time spent to dream, draw and reflect. Feeling the soft wind over my warm skin as I hear the sound of waves rolling into shore is one of my favourite sensations. The beach. Whether you were born on the coast, moved to the coast or love to vacation on the beach you know the feeling I'm talking about. Sometimes I stare far out into the ocean at the horizon dreaming about the future, other times I get mesmerized by the waves crashing and wonder how I can mimick the beauty in a piece of jewellery. Or else I just sit and watch as the water rushes into shore, running for miles along the ocean, how far has it travelled before it finally meets the sand? As I write this I continue to take long breaks looking out over the surf, I forgot my notepad back home but luckily my purse always packed with a pen and some scrap paper which I doodle on, I draw waves. Different sizes, shapes and forms and try to discover a new and unique way of turning it into a piece of jewellery. I'm grateful for the time to reflect but equally eager for the day when I get to craft these thoughts and doodles into pieces of art. When I return home to my jewellery bench there will no doubt be several pieces of waves and surf that will begin to appear in my travel collection. Most people start a business because they are passionate about the product or service they are creating. A chef will open a restaurant, a designer will start a clothing line, a drummer will create a band etc. For most, the art comes first, business comes second. Certainly that was the case for coastal chains. Designing jewellery came first then the sales and business management second. Making jewellery as I travel is a similar situation. First I thought about what I wanted to make, then I found the ingredients to do so, then I put the time and love into crafting. After I had my product I started to think more about who, where and how I was going to sell it. I spoke with travellers I met along the way, some thought I could sell it in the streets like local Mexicans do, others thought laying it out on the beach would be a good idea (which I tried but didn't last more than 30 minutes before the Policia Municipal showed up and made me put it away). Finally I decided that with the travellers as my target market why not set up shop in the comfort of a hostel? And so that is what I have started to do. Each new hostel I come to I scope out a good table or space to showcase my jewellery, sometimes I ask if it's okay, other times I just go for it (beg for forgiveness rather than ask for permission right?). I'm really loving this new tactic, it is a great way to meet people, share my coastal chains story and sell product. The travelling client, who would have thought that there was one more reason to love hostels! 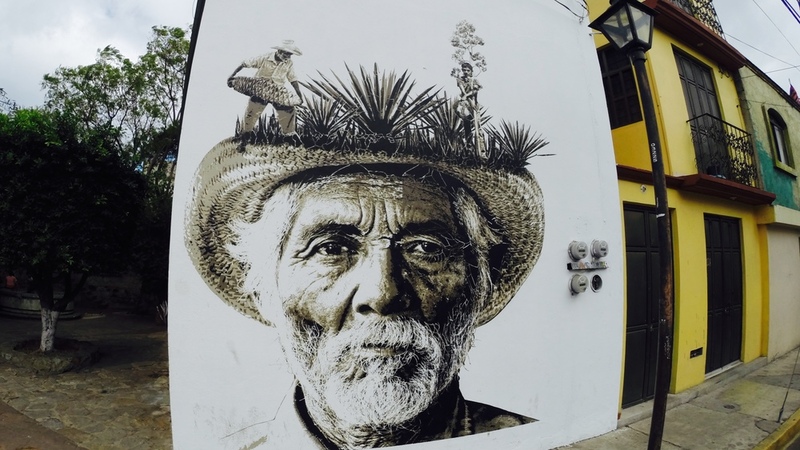 Oaxaca City - an artists dream. The city is clean, cobblestone streets, the buildings are coatedwith street art. It is common for travelling artists to come to visit and end up staying for days, weeks even months longer than expected. One artist in particular that I met was an illustrator and drew these incredible intricate images. One night we got talking about art, life and the generation of acceleration. He was very proud of his work but often mentioned his desire to take it to the next level, to make next year a revolutionizing year for his work. This comment really inspired me, I thought about my jewellery and the pieces that I’ve made on the trip so far but more importantly the types of pieces I want to be making. I am going to devout the next couple months to really pushing myself, trying new ideas and always expanding my creativity. Beading is a whole new art, a whole new way of making jewellery for me that I haven’t explored since I was a child making friendship bracelets. It has taken me a little while to really figure out what types of jewellery I want to make on this trip but I think I am finally getting into a groove. I will be posting my new creations on Instagram @coastal_chains and Facebook, if you see a piece you wish to purchase go to the Shop section to make your purchase. A mystical town 8000 ft high, this little village literally lives in the clouds. We arrived in a group of 6 and stayed in log cabins overlooking the valley. As it grew dark (and after a couple cervezas) I turned to my two friends and asked “if you could live anywhere in the world for the rest of your life, where would you live?”. “Thailand!”, one of them answered, “here!” the other said. Than I sat silent for a few minutes, I had stumped myself. I started thinking of all the places I have been (to date 23 countries, by the end of this trip hopefully around 35). I thought about the bright colours and beauty of Africa, the deep history in Europe, the long waves in Australia. The question followed me for a few days, then it finally hit me. Vancouver. I choose Vancouver. A clean city with friendly people located on the water next to the mountains. A city where you can ski, hike, bike and beach all in one day. A location surrounded by mountains that everyday you could reach a new peak. My answer filled me with joy. How lucky am I that I get to live in the city I choose and also explore the world? I wondered how many people in the world would choose a new location, how many would choose home? Everyday I am grateful for the new experiences I get to have and in the same breathe grateful to have a beautiful mountain town to call home. I love you Vancouver. Mexico, like every country in the world, has an abundance of jewellery. However most of it is poor quality, manufactured plastic. As I travel I always have my eye out for quality and high fashion jewellery and in Puerto Escondido I found just that. After escaping the heat to refill our water bottles we stumbled across a jewellery store that was in the process of being built. My dream jewellery layout to be exact, a working space in the back half with jewellery benches and an abundance of tools with a store front and gallery to show off and sell the final products. After chatting for close to an hour with the couple who were building the shop we found out they too had travelled Central America making and selling jewellery. 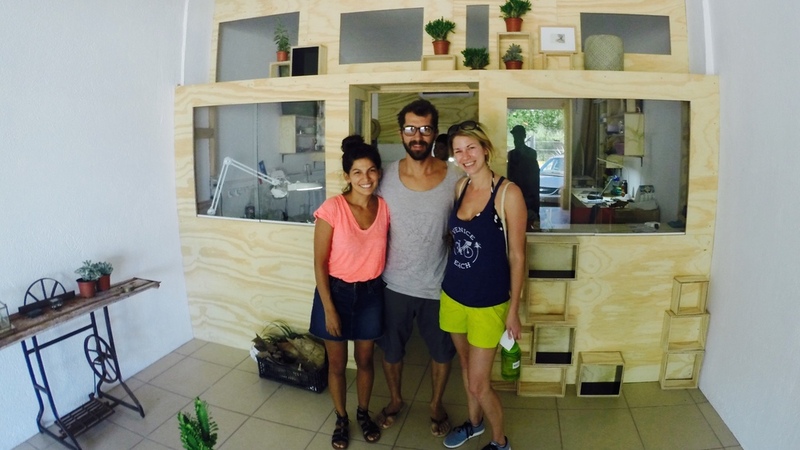 They owned a boutique in Paris and Puerto Escondido was now going to be their home base to make and showcase their beautiful creations. Like me, they work with a lot of silver, they solder rings, earrings and bracelets. We exchanged info and continued on our day excited about our new likeminded friends! Travel and adventure drives my inspiration which is one of the reasons why I spent 6 months travelling throughout Central & South America. Read up on some of my travel adventures here. I will also be posting some fun jewelry tutorials and posts on life as a jeweller.